A university is privileged to something only human beings can find deep within themselves, an understanding of pure knowledge. Wisdom is not a product of schooling but of the lifelong attempt to acquire it. We don't know a millionth of one percent about anything. 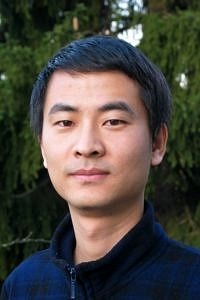 Dr. Liang Zhang got the prestigious Alexander von Humboldt research fellowship to carry out his postdoctoral research at FAU under the supervision of Prof. Dr. Hans-Peter Steinrück at the Chair of Physical Chemistry II. What is your field of research? My research focuses on the fundamental physical and chemical understanding of the mechanisms and processes involved at the surfaces from an atomic level. For my research at FAU, it is mainly about “surface science with porphyrins”. What exactly sparked your interest in that subject? Surfaces are the outer boundary of any condensed material. Theses surfaces usually dominate the interaction with the environment and play a decisive role in numerous natural and technological process. Therefore, it is of great importance to understand the elementary steps of surface reaction. The FAU group is one of the leading groups in the area of surface science in the world. What were your reasons for choosing FAU as your host institution for a research period abroad? My host Prof. Dr. Hans-Peter Steinrück in FAU is a well-known expert in the area of surface science, and in addition, he is also the visiting Professor of my home university. After I got my PhD degree from the University of Science and Technology of China in 2013, I contacted Prof. Steinrück and we applied together for the AvH research fellowship. How visible is FAU in your field of research on the international stage? As I mentioned above, Prof. Steinrück is a worldwide expert in our research area. Specially, the group is one of the leading groups in the area of “surface science with porphyrin” in the world. If you compare your home University/research institution to FAU: what are, from your point of view, the most evident differences? For FAU, I think the researchers here focus more on the fundamental research; but simultaneously, they have close collaborations with the industry, such as BMW, BASF. Could you give us a short summary of the project your research group is working on? “Surface Science with porphyrins” pays specific attention to the synthesis of metallo-porphyrinoids by in-situ metallation on a surface, their formation of supramolecular networks, their internal conformation, their electronic interaction with metal substrates and the adsorption of small molecules at their metal center. What is your main task within your research group? I mainly use scanning tunnelling microscopy to investigate the adsorption behaviour of different functionalized porphyrin molecules on metal surfaces at an atomic level. What are the most important results of your research at FAU to date? We have found that the functionalization of porphyrins can significantly influence the adsorption behaviours of porphyrin on metal surfaces. The related results have been published in several high-impact journals. How does your research benefit or affect society? The results of our research are closely linked to the real application of porphyrin-based organic electronic devices, such as organic light-emitting diodes, field effect transistors and photovoltaic devices. They provide insights into the interaction between complex organic molecules and solid substrates, which is a key issue for the development of functional interfaces and plays an essential role in the engineering of nanoscale architectures on surfaces. What were your first and subsequent impressions of the Erlangen-Nuremberg region? My first impression about Erlangen was the size: it is much smaller than any cities in China, not only the area but also the population. Then I got used to such kind of life: it is convenient and enjoyable. Most importantly, I can reach everywhere by bike, which is another advantage of small city. My daughter Hanna was born in Erlangen. Can you already tell us a highlight, a moment from your stay, which you find particularly memorable? My daughter Hanna was born in Erlangen in 2014, which I think is one the most exciting things for me during my stay in Erlangen. In addition, I made quite a lot good friends here, not only German but also people from other countries, including China of course. What are your favourite places at FAU and Erlangen-Nuremberg? I like the Schlossgarten very much and I often go there with my family. Is there anything else you would like to mention? Thanks for your interview and I would like to come back to FAU in the near future. Dr. Liang Zhang received his doctoral degree from the University of Science and Technology of China in 2013. During 2010 and 2011, he was a visiting student at Advanced Light Source of Berkeley National Laboratory in USA. He is also the recipient of Alexander von Humboldt research fellowship (2014), President Award of Chinese Academic Society (2013), Award for Excellent Doctoral Student granted by Ministry of Education of China (2012) and National Scholarship (2008). From April 2016, he will take a research position at the Lawrence Berkeley National Lab in USA.